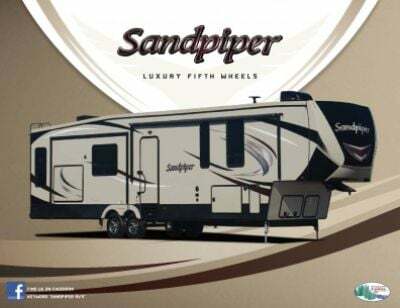 Your family will have a blast inside the 2019 Forest River Sandpiper 384QBOK 5th Wheel! National RV Detroit in Belleville, Michigan has been selling the world's best RVs at wholesale prices since 2008! Our friendly, knowledgeable, and professional staff specialize in helping our customers find the perfect RV at a price that can't be beaten anywhere in the nation! So stop in today at 44700 N I 94 Service Dr Belleville Michigan 48111 and let us help you find the RV of your dreams at a dream price that will save you $1000s! Don't worry if you don't live in the Belleville area, or even in Michigan. We transport anywhere in North America with our fast, reliable 24/7 delivery service! Our personalized phone and internet service means you can go online, give us a call, and be on the road in your dream RV in no time! So call us today at 734-439-3400! Enjoy fun family time outdoors without getting sunburned thanks to the 15' 0" awning! Trips are easy with this RV's hitch weight of 2261 lbs. and GVWR of 15500 lbs. 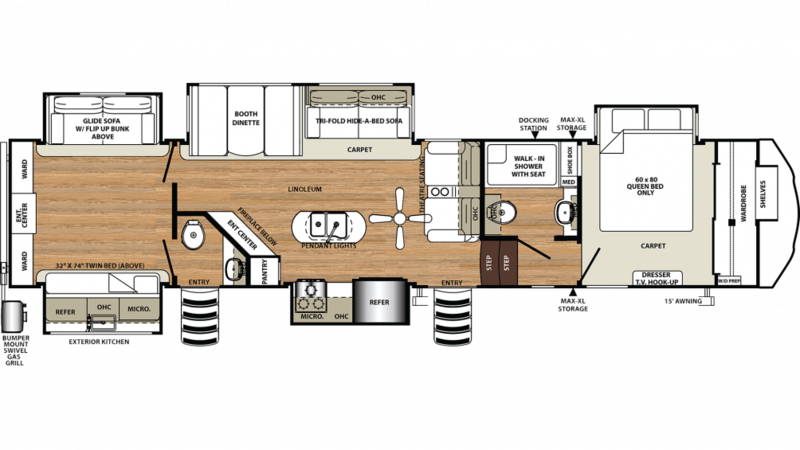 At 41' 8" long, 8' 0" wide, with 5 electric slides, the living area in this 5th Wheel is comfortable and spacious enough to accommodate your whole family. No matter how hot or cold the weather is outdoors, the modern 15000 BTU a/c unit and the efficient 35000 BTU furnace will keep the climate inside at the perfect temperature! You'll always be able to feed your family nutritious meals on the road because the 2019 Forest River Sandpiper 384QBOK includes a great kitchen, complete with a 3 burner range cooktop, 20.00 cu. ft. refrigerator, and more! No longer do you have to succumb to the damp and cramped communal bathroom! Enjoy the use of your own private bathroom, complete with a Porcelain Foot Flush toilet and a spacious shower! 60 lbs. of LP tank capacity keeps your showers hot throughout your vacation, and there is a 134 gallon gray water tank and a 104 gallon black water tank that discreetly store the used water and waste! Check out the bunkhouse and you'll see comfortable Twin! There's a total of 4 beds throughout this comfy camper!